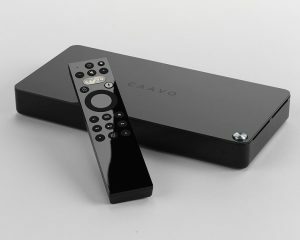 US-based Caavo has launched Control Centre, a new entertainment hub that is designed to unite all devices connected to a users’ TV. The set-top device comes with a universal voice remote that can be used to search across live TV, DVR, streaming services and web content. “When Caavo introduced our first entertainment hub in February of this year, we solved unified search and control across multiple platforms, which is great if you know what you want to watch,” said Andrew Einaudi, CEO and co-founder of Caavo. Users can connect up four devices to the Caavo box, including satellite, streaming media players and game consoles, and the device works with Google Home and Alexa, sound systems, 4K UHD, HDR and Dolby Atmos. It is available in the US priced at US$99.95 and comes with a service plan that costs US$19.99 per year or US$1.99 per-month.